Hi; Mom again! One more post for me on these 12 days of Christmas. Two precious people in my life are my husband, Cliff, and my mother, Flo. First of all, Cliff is very gifted mechanically. We have a policy in our home that we don’t throw anything away until Cliff has had a look at it. 9 times out of 10 he can fix the broken coffee pot, toy, chair, or grain grinder so it lives another year. Cliff’s favorite color is maroon, and his favorite yarn is Cashmere. (Well, whose isn’t?) 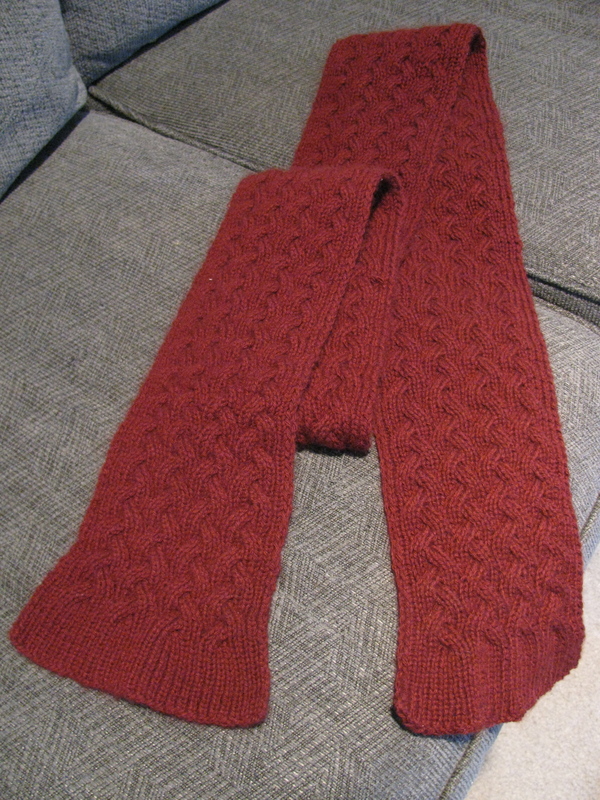 So this year for Christmas I knit him a double-sided scarf made from JoJoland Cashmere. 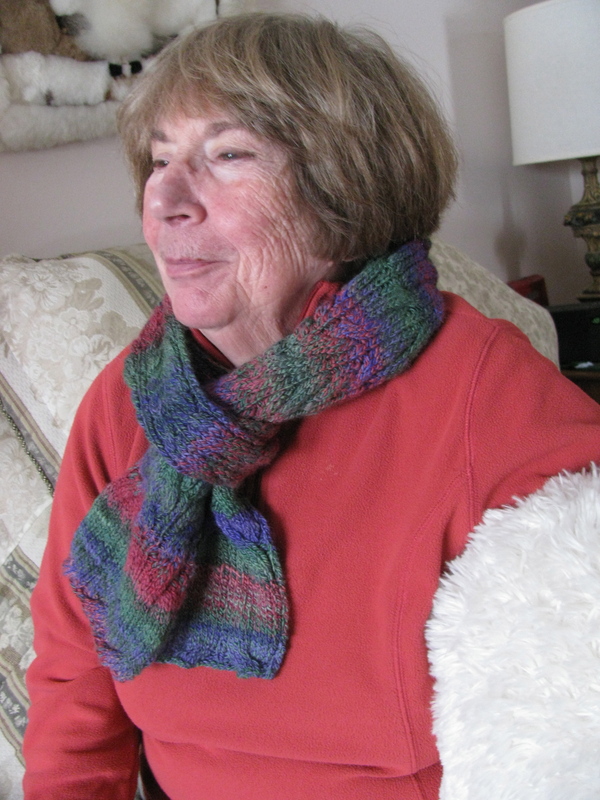 The pattern was adapted from “Reversable Cable Shawl” in “The Prayer Shawl Companion” by Janet Bristow and Victoria A. Cole-Galo. This stitch creates a double sided cable by cabling in a ribbed stitch! 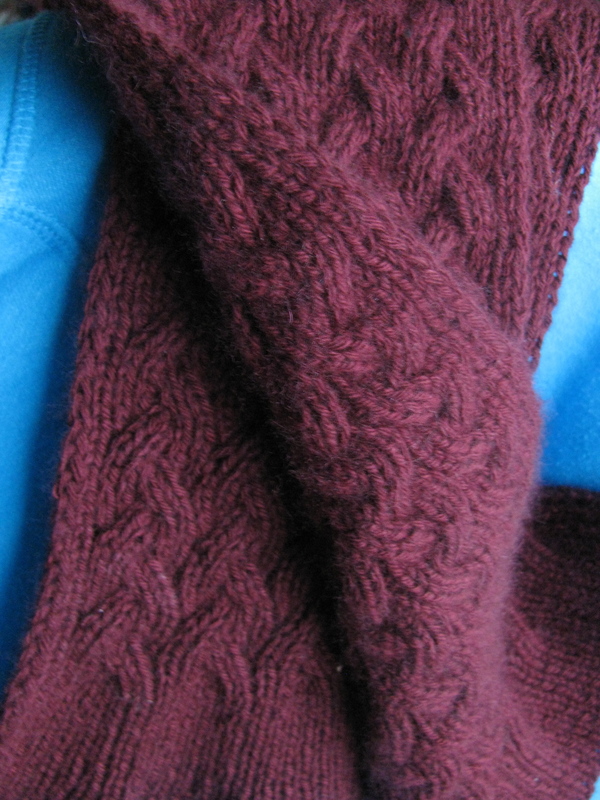 I found it a bit tricky to knit and of course cashmere is somewhat slippery, but the final effect was perfect. 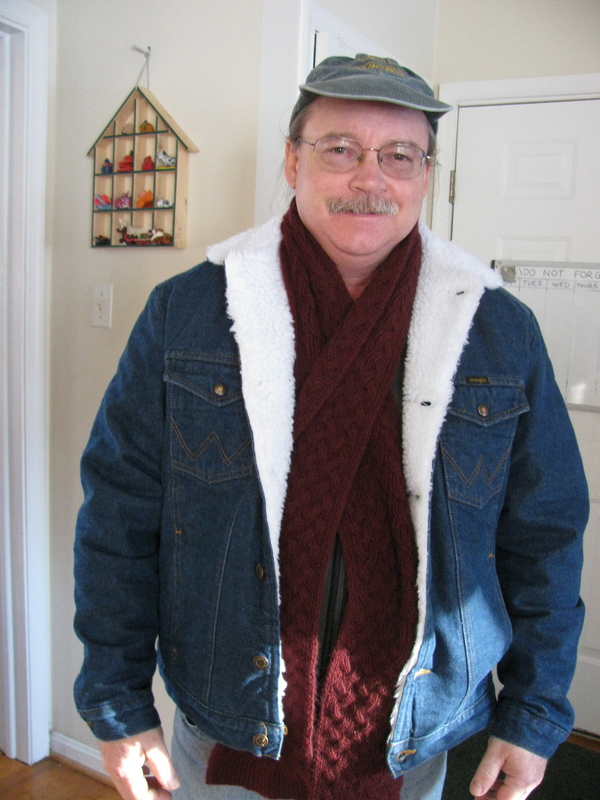 Here he is wearing it as he’s about to go out and clear the driveway with our rickety snow blower. He said later it kept him very warm. My mom, Flo, is also an artist. 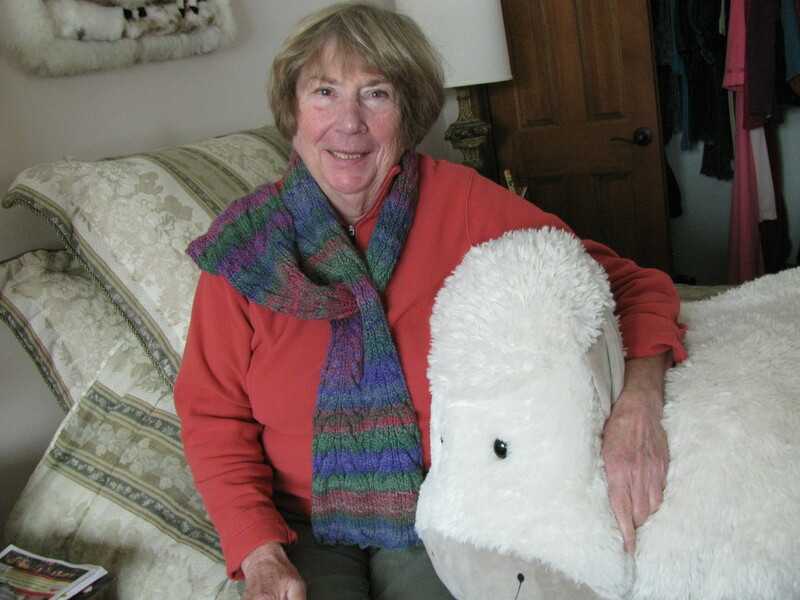 She first taught me to knit, crochet and sew when I was a pre-teen, and she made a blue sweater for me around that time. 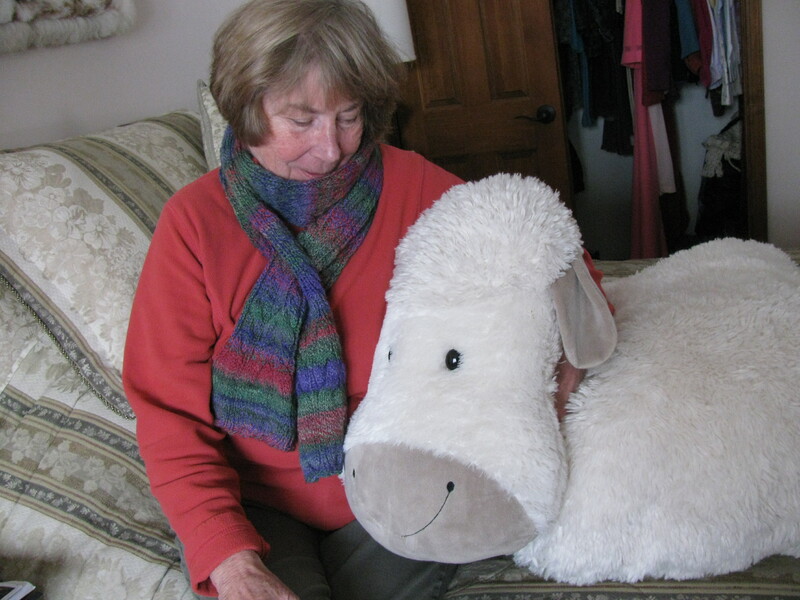 She even made a pair of Aaron sweaters for herself and my dad eventually, but did not hang onto the knitting bug. She mostly loved to paint…..or sew…..or build puzzles…..or lay bricks for a side walk…..or remodel her house. These days, settled in a nearby apartment, she is brilliant at re-modeling clothes. 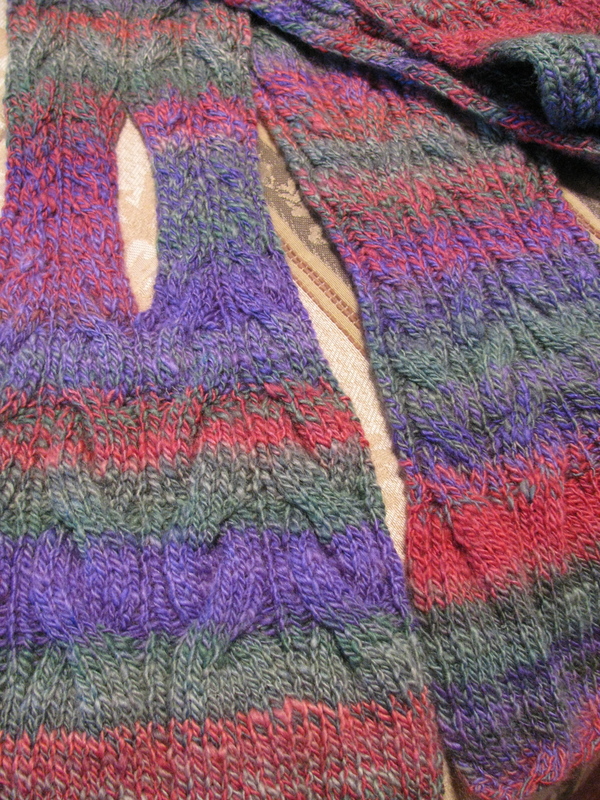 Years ago she gave me all her knitting needles, but occasionally she borrows them back to modify a sweater she bought that was too long….or shrank in the dryer. Her scarf is made from some early yarn I spun. Some years ago, around the same time I bought my spinning wheel, I bought 2- 4oz braided rovings in the same colorway. One was merino and the other was BFL. I wanted to try out both and compare how they spun up. I eventually spun these 2 rovings up in the summer of 2012. Each roving was spun separately, and then plied together. They are plied too loosely because I didn’t yet understand how that works. But I rationalized that the two plies were not any worse than simply holding two singles together. My mom was the only one who actually said she liked the way the finished yarn turned out, so I planned all along to make something for her out of it. She said it looked like a Christmas yarn. How sweet. It was actually quite nice to knit with and soft to wear on the neck. In addition, just for giggles and because Rebecca and I were experimenting with different spinning techniques, I spun some of the merino/BFL with a gold thread. With that portion, I made this beaded bag. 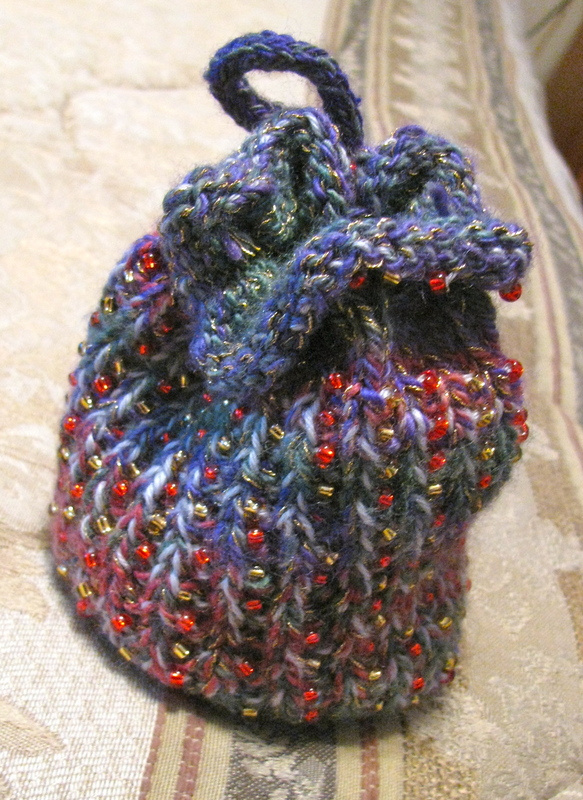 That pattern is “Wullenstudio Beaded Pouch.” It was a fun little project. Thank you dear Mom and Cliff for being such a support to me over the years. I would love to see a post showing us your workroom. I want to see Cliff’s designs (I’ve never seen anything he’s done).